This is a long introduction that is worth your time, but if you'd like to skip to THE LIST, Click Here. Before I get into this, let me say, it has been suggested I make too much of "non-salvation issues." I will say that I do make much of them, but only because Christ said to "make disciples of all nations, teaching them to observe whatsoever I have commanded." He commanded more than believing on His name, but rather, an entire moral and ethical system, a worldview, even an entire Kingdom Culture, which is to be observed by those who gain citizenship therein. Recently, I came upon the name of a movement that is what I essentially believe, having never known before that there was a "group" of people who thought as I did. Now, I won't go so far as to throw my weight behind this movement, because I only speak for myself - but their idea, seems to be my idea. This group of believers are called "Paleo-Orthodox," and the idea is that the earliest consensus view, and the earliest practices and beliefs of the Christian community, are the correct ones, understanding that truth must precede error. Error of doctrine diverges from some original truthful one. We inherently know this. That is why we look to the Scriptures for our guide of faith and practice, because it is the earliest source we have - that of Christ and the Apostles. "There is no shortage of interest in the writings of the early church fathers – and for good reason. 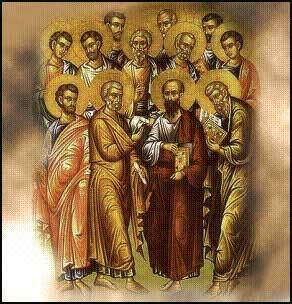 They were men of conviction and faith who sought to vibrantly live out the teachings of Christ and the apostles without compromise. They purposed to disseminate those teachings throughout the earth, to contrast the holy nature of God with the paltry offerings made by idols and the minds of men. In this quest, they largely succeeded. But as it is, over time, those who were closest to those world-shaking events at the beginning of the first century died off, and only the hearers of those men were left. After that, only the hearers of those hearers, and so on. The charge of Christ and the apostles to keep the teaching pure was challenged, and the prophetic warnings against false teachers and heresies were brought to fruition. The future of life-giving gospel depended upon the faithfulness and zeal of those who would preserve the message at all costs. Many, if not most, of the early church fathers traded this temporal life for an eternal one, and gained a crown by God through the trials of martyrdom. In following their Master in their life, they were received by Him in glory, in like manner of His death. In my study of these men of virtue, I have come to respect them greatly. They were each of different character as men, but made of one spirit by God. They did not agree on every matter of faith and religion at all times, but they always sought the truth, first through the Scriptures, and second through the verbal teaching of the apostolic tradition.In the pursuit and protection of truth, the essential doctrines necessary for salvation have been brought down to us to the present day, 2000 years later, unchanged, untampered and uncorrupted, carried along by the will of the Sovereign God. I am proud to know that I believe on, and pray to, the same One who was preached those many years ago. It is astounding to consider it. Our faith is not one of those things which ought to "change with the times" or adapt to fit with the current waves of thought by the fancy and reasoning of men. The gospel's power lies in it's contrast to the natural man and the natural kingdoms. The church fathers understood this, and exalted this, whereas in the present day we seek to reconcile the teachings of Christ and the Kingdom of God with the ways of the world, and make them comfortable for the natural man, resulting in a pointed hypocrisy, which the detractors of the faith are quick to expose. Rather than killing off the natural man with the standard of our way of life in the Spirt, the modus operandai of the present day is to make man as comfortable as he can be while in the world, yet still professing to be a Christian. Let it be known though, the early church fathers are not themselves a sole authority on any given topic, but their writings are a commentary on the ways and beliefs of the earliest believers in Christ. The Scriptures are the authority on all matters of faith and living. However, the early church fathers are an apt means to color the Scriptures in a context of culture and contemporary events, to demonstrate how the teachings of Scripture were being lived out through the initial understanding of them. They allow us to discover what was the earliest consensus view on a topic, which is most valuable since logic affirms that the earliest consensus is likely the authentic teaching. Truth must always precede error, for error is a corruption of truth. As one moves further in time from the source, if the consensus changes, it is likely an aberration of the original understanding, or a later justification. Their testimony can be the arbiter for those very issues that divide us when each side today seem to be able to make a sensical case from the Scriptures. With some topics discussed by the church fathers, there is no clear consensus, opinions vary, and accordingly, those matters are left to the faith and conscience of the individual - I do not address those matters herein. However, there are some matters on which there was practically no dissension, and were the affirmed, settled teaching of the church. The scope of this book will not be to play favorites on issues that divide us today, to cherry-pick those quotes which support my views to settle the issues. No. Rather, this book is purposed to expose the issues, beliefs and practices that were entirely one-sided in the early church, to which some in the present day find themselves on the opposite side of. Some things which are small matters to us now, loomed large in the role they played in the early Christian life. Conversely, some things which are a major part of today's Christianity had no place in the early church. Each present-day sect may be at variance in different ways, but I know of none that are in perfect conformity with the earliest teachings of the church. There was a time that was a distinct line in the sand when it came to a change in certain attitudes of the church. That time was with the reign and conversion of Emperor Constantine in 312. At that time, the church began a slow reformation, where it was no longer esteemed to be a competing Kingdom with the kingdoms of the world, but became the state religion of the most powerful empire ever known. Certain doctrines and ways of Christian living were justified and adapted to be congruent with worldly power. No longer the chaste virgin of Christ, she was married to a wealthy and powerful suitor which sought to disrobe her of her otherworldly trappings. Being a Christian was no longer the commitment of death to the world, but became the inheritance of citizenship in the Roman Empire. This is not to cast dispersion upon true believers, who have been numerously present and richly vocal throughout all of church history, in every era, and every denomination. However, it is beyond dispute that the record of the church of God in the world is fraught with wanderings and mistakes, many of which have been recovered from, some we have not. The Scripture speaks of two forms of tradition, which are contrary to one another. There is one where Jesus bitingly says, "And why do you break the commandment of God for the sake of your tradition? ... In vain do they worship, teaching as doctrines the commandments of men." It is this form of tradition He speaks against: the addition of rules and doctrines, beliefs and attitudes, unconfirmed by Scripture, which are then taught and handed down as if they were present at the source. It is handed down by men and not from Christ. This is evil, and an unclean leaven in the doctrine of the church. The other form of tradition spoken of in the New Testament is the kind mentioned in 1 Corinthians 11:2, where Paul says, "Now I commend you because you remember me in everything and maintain the traditions even as I delivered them to you." and in 2 Thessalonians 2:15, "So then, brothers, stand firm and hold to the traditions that you were taught by us, either by our spoken word or by our letter." These verses demonstrate a virtuous kind of tradition which is actually "delivered" in two ways, "our spoken word" and "by our letter." The "letter" lives on in the New Testament, but the "spoken word" lives on in those hearers and disciples, who heard and conveyed those teachings. I submit to you, that where the earliest, most ancient one-sided consensus exists, that also has found it's witness in the written word of the New Testament, that is the authentic teaching of the apostles. This is known as the "apostolic tradition." This is the tradition that Christ and the apostles exhorted us to cling to. May you, reader, have the courage to put your own presumptions, doctrines, and traditions on the line, and be challenged by those who were unencumbered by time and distance from the truth we desire. If we seek the truth of God and not the rationalizations of man, the commentary and assertions of the earliest believers are a meaningful way to discover the authentic teachings brought forth from the Living Word, and those whom He sent. I say rarely practice, because there are, of course, many, who do practice certain aspects of this list, but it truly is rare to hold the entirety of it. I know some of the things here are controversial today, but each thing listed was the practice of the earliest believers for about the first 300 years. Their practice is affirmed by Scripture, and the testimony of the early church fathers. Therefore, the question is, why do we hold on to our own private interpretation of Scripture, when the proper understanding was preserved for us in the practice of the early church? A Christian is not defined only by what they believe, but what they do. Our Christian walk was not intended to be reduced to believing the right statements, speaking in tongues, and having exhaustive Bible knowledge. It can be those things, but it is also adopting the culture of the Kingdom you belong to, and holding the attitudes of your King in the greatest esteem. In short, its not just believing that Christ is who He claims to be, but obeying His commandments also. John 14:21, 23 "Whoever has my commandments and keeps them, he it is who loves me. And he who loves me will be loved by my Father, and I will love him and manifest myself to him. If anyone loves me, he will keep my word, and my Father will love him, and we will come to him and make our home with him." Scripture references are not exhaustive, just a quick sampling on the topic. If you disagree with my interpretations, don't argue with me, take it up with Ignatius of Antioch (hearer of John), Polycarp (hearer of John), Justin Martyr, Origen, Tertullian, Clement of Alexandria, and the others. Being a priest and king in a heavenly kingdom disables the ability to be a worldly one. No oaths also prevents this option. Extreme Forgiveness precludes this option for the Christian. I want to clarify, there are people who practice some on this list. I know of people who practice several. I know that I, myself, am growing to adjust my beliefs and practices to be as accurate to the teaching as I can - and I have so far to go! This is meant as a means to examine ourselves and the Bible, and pray and make correction where we feel it's needed. What lover of truth would spurn that opportunity?